There is not a lot of what one would call “highbrow” happening in popular music these days. Every once in a while someone like jazz drummer/producer Brandon Williams or alternative soul outfit Moonchild will come along and deliver something you feel you should be dressed up in your finest and theatrically sipping top shelf cognac to, but in our all too coarse world such an occasion is rare for even the fanciest of us. Everything about the sparkling fourth album by Parisian pianist, composer, and producer Meeco feels top drawer, sometimes for the worst, but more often than not for the best. The trick is to be refined and sophisticated in this musically rarefied air without dissolving into a sickly sweet port of overly sentimental tastes. To call Meeco’s highly curated single-producer compilation rhapsodically romantic is not to put too fine a point on it; the candlelight and swoons are built into this transport to this fragile fantasy world. Souvenirs of Love is at its best when there’s an ache or a modern edge to be found in the song. Often Souvenirs… roughening elements are ushered in by the guests spots featured throughout Meeco’s collaborative proceeding, such as vocalist Aaron Marcellus on the melodic caress that is “Every Day” or soul star Yahzarah going to a heavier place to deliver the country soul of “Make My Dreams Come True.” Conscious rapper Talib Kweli on his match-up with trumpeter Wallace Roney, saxophonist Vincent Herring, and famed German spinmeister DJ Stylewarez may be one of the best examples of uptown meeting downtown in a rolling groove that conversely pulsates with both street life and elegance. The whispery silken take of Jean Baylor (of Zhané fame) on “If Only I Knew” bridges classic R&B balladry with traditional jazz, thanks to the Eric Reed’s singular piano solo and trumpeter Eddie Henderson’s sinewy sound accompanying Baylor throughout this soul embrace. Romantic duets are coming back in vogue, at least on the independent and international stages, and “Can’t Get You Out Of My Mind” featuring Yahzarah and Aaron Marcellus sits nicely in this trend with a fairly aggressive bridge and emotionally resonating vamp out that keeps the pair from stepping into schmaltz. Not everything on Meeco’s cosmopolitan affair is that fortunate. The atmospheric “Paris at Night” paints in soft watercolors with Baylor and Herring returning center stage, this time with vibraphonist Stefon Harris on an impressive solo, but is all too impressionistic to serve as a substantive or memorable composition. It feels like an imitative echo of ‘60s era jazz balladry that works hard to be haunting, but lyrically lacks the resonance to do the job. Vocoderist/keyboardist/saxophonist Casey Benjamin of the Robert Glasper Experience has a compelling moment in a free floating showcase with flutist Hubert Laws and guitarist Lionel Loueke, but the relevance of its avant-garde construction slips away almost as soon as it arrives like an abstract artwork whose artistic meaning always feels just beyond your grasp. The cloying “Words of Love (featuring Yahzarah, John Scofield, and Richard Bona)” joins “Paris at Night” in just being satiny mood music that is shimmery in its polish, but feels hollow inside its pretty picture box. Sometimes the pretty is appreciated. On a more fitting collaboration with Yahzarah, the moving Herring is wondrous on his aerial solo on the full first half of “For You,” which feels like early Roy Hargrove in its night song. Similarly, on “Farewell,” Hubert Laws, Jaques Morelenbaum, and Eric Reed illustrate in a violin, piano, and flute composition that would not be out of place as the score for a pedigreed dramatic film up for Academy Award consideration. The fluid song’s studied movements are warm, sincere, and feel deeply personal. 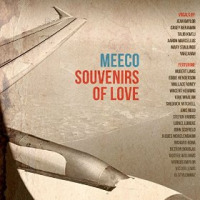 In fact, most of Meeco’s emotional work on Souvenirs of Love feels intimate in nature and technically skillful to a fault. How much one comes to love its sometimes melodramatic sharing depends on just how much one can wholly welcome stepping into its embroidered story world of brocade and lace and languishing there, waiting to be ravished for an hour or so by moonlight. Recommended.